Young American backpackers are walking through a decayed socialist housing estate neighbourhood, horrified by a barking dog with a human hand in its mouth and a lady pouring dirty water out of the fourth floor. Well-known scene from the US-produced comedy Eurotrip depicts Bratislava as a symbol of “Eastern Europe” by a run-down prefabricated housing estate area. The reality is, thank God, far from this picture. Nevertheless, prefabs are a significant characteristic of Slovak urbanism. Some of them, especially neighbourhoods in Bratislava and Košice, are even becoming a part of the destinations tourists are offered. Almost one third of the population in Slovakia and around two thirds of population in Bratislava live in prefabs built after the 1950’s. Socialist planners applied prefabrication, a concept brought to life in Western Europe as soon the end of the First World War, as a solution for mass housing during rapid urbanization that came hand in hand with massive industrialization. Improved living standards for people of all social classes justified massive impacts upon former urban structures, architecture, local genius loci and traditions. A New identity of Slovak towns became a reality. After post-communist transformations, prefabricated housing estates represent an interesting insight back to the past through socialist urbanism, architecture and art. 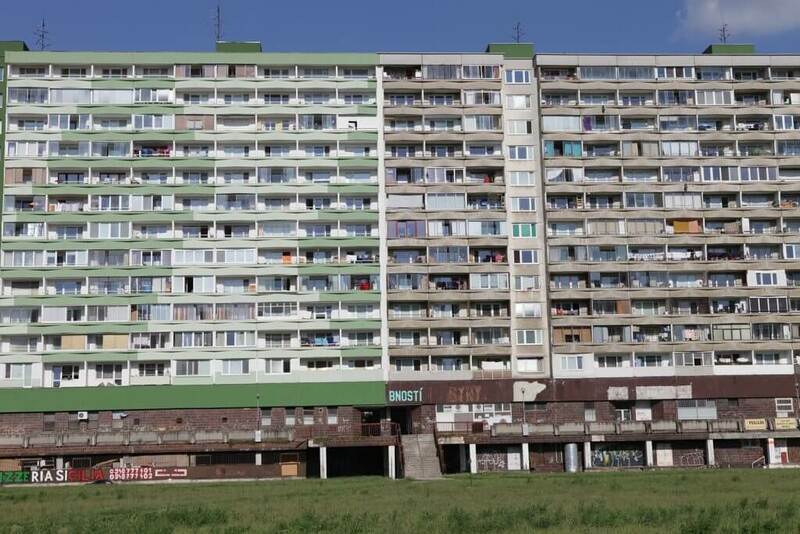 Petržalka, one of the largest prefabricated housing estate areas in Central Europe, became a legend. Built between 1973 and 1989, transforming itself from the unwanted child of Bratislava and so-called “Bronx of Bratislava“ in the 1990’s, Petržalka is now green and a relatively pleasant place to live, with good options for free time activities and accessibility to the city centre. This neighbourhood, surrounded by the lowland forests of the Danube river and former Iron Curtain border with Austria dotted by pre-WWII military bunkers, with a canal in its central zone now has its own tourist map brought to life by a local photographer Martin Kleibl. Several tour operators organize guided tours through Petržalka as well, some of them even offer a lunch with local families in their apartments. Contrasting to Bratislava, the urban structure of Košice is typical by its extensive historical city centre located in the valley and surrounded by prefabs upon the hills. One of the block in Furča was used as a platform to locate the Memorial of folk architecture by artist Tomáš Džadoň. An Authentic traditional rural wooden cottage stood proudly with a sharp contrast to a prefab, until inhabitants rejected this project. Socialist housing estates in Košice can also be explored in an authentic 1980’s Škoda car with local guides. This alternative tourism is becoming a way to commodify with past communism. If provided honestly, avoiding marketing shortcuts and without censorship, it can also be a way to confront ourselves and share the experience of communism with foreign visitors. ⟵Pressburg, Pozsony or Post-communism: what is Bratislava?